"Hypercool. It’s like the Golden Age of sci-fi got an upgrade, with all the big honking space cannons and some desert planet dry humour thrown in for the bargain." "Highly recommended, snarky sci-fi adventure." "A wisecracking caper that nevertheless doesn’t skimp on the details and human cost of interstellar war, like John Le Carré meets The Stainless Steel Rat. Moren is one to watch." "Immersive, intergalactic spy-fi. Moren gives us a Cold War thriller with wormholes and anti-grav fields." 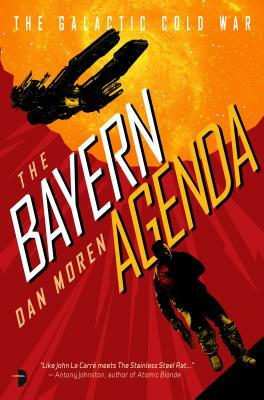 "The Bayern Agenda is exactly the dose of intergalactic espionage you need. Action, humor, and pathos, wrapped up in a plot that Le Carre would be proud of ... Moren is one to watch." "The action scenes, both on the ground and in space, show a focus on thoughtful planning and careful pacing. The characterization delves just enough into emotionality to give the characters realism without moving the focus away from fights, intrigue, and spycraft." "A great spy story, with tidbits of science explaining the intergalactic travel and even a hint of romance to come." "An action-packed thriller with a new twist in every chapter--the kind of book you don't want to put down. The Bayern Agenda reads like Mission Impossible set in space. Filled with well-rounded characters and an incredibly rich backstory, Moren brings his vision of a cold war galaxy to brilliant life." "A frenzied story full of bold spycraft and exciting ground and air chases... Fans of suspenseful space opera will look eagerly for the next book. "